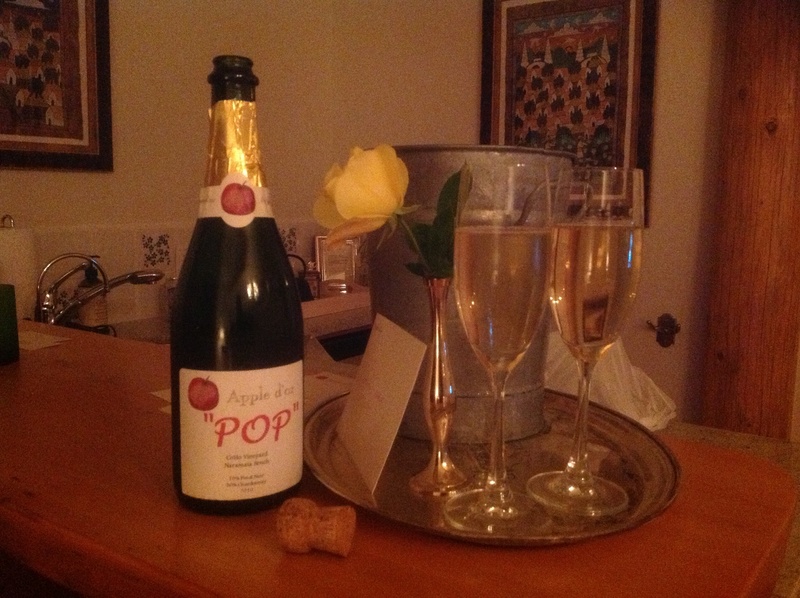 My husband (aka My Man/MM) and I are celebrating our 30th wedding anniversary this year. We were married on the Victoria Day long weekend in May and each year we try to do something unique or go somewhere that is memorable to mark the date. Every year is a new adventure! We often like to surprise each other and this year was no exception. MM gave me a little “blue” sparkly, and for those who know me well, know that I like jewelery and enjoy wearing it even when I garden. I’m no fashionista, but I see no reason why a bit of bling doesn’t go well with blue jeans, plaid shirts and wellingtons (Ukrainian gumboots)! My gift for my husband, on the other hand, was a bag of licorice and several road maps! You may think it strange and that’s okay. I know he thought it very strange at first but being good-natured as he is, he went along with my plans. I told him that we were going on a road trip…location is a surprise! So how does my man prepare for a trip to an undisclosed location? What does he pack? Will he need a passport? Are we flying or driving? Well needless to say, I gave very little information about what we were doing or where we were heading. I did provide a list of what to pack for a four-day adventure…warm clothes, rain gear, hiking boots, shorts, golf shirts and swim trunks. Oh yes, don’t forget good evening clothes as we would be going to a few nice places for dinner! Can you sense that maybe my husband would be getting a bit impatient with me? We started out early on Tuesday morning just after breakfast and drove for approximately 5 hours to the interior of our province British Columbia. We took the Hope-Princeton highway driving through Manning Park and stopping for lunch in the cozy little town of Princeton. 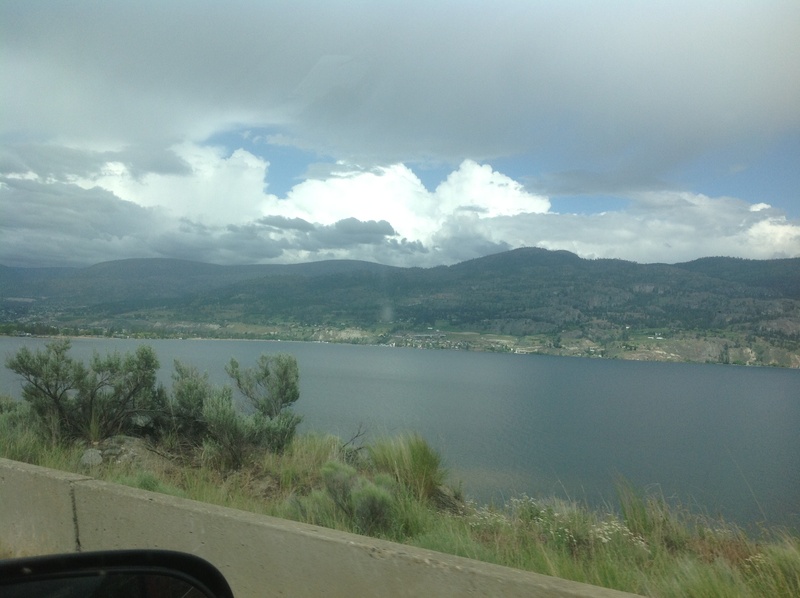 It was raining off and on but the weather cleared a bit as we headed for the beautiful Okanagan Valley. 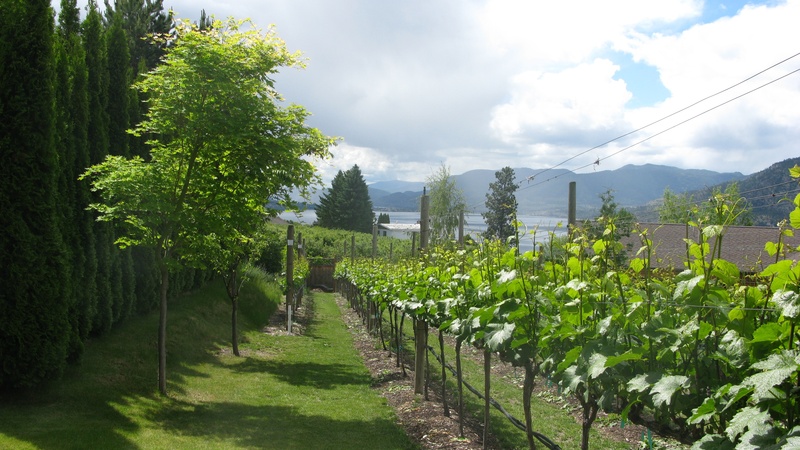 Situated in the interior of the province, the Okanagan Valley stretches more than 100 kilometers. The Okanagan Lake fills most of this valley. There’s a vast array of wildlife here that includes big horn sheep, cougars, bears, burrowing owls and even rattlesnakes. This bear was munching on some roots and did not mind posing for us. Canada’s only desert is also in the Okanagan. With this diverse terrain, unique microclimates have created conditions ideal for growing grapes and producing a variety of styles of wine. So here we are in wine country and we are staying at the Apple d’or Bed and Breakfast in Naramata. This Apple d’or Guesthouse is a fabulous 5 star Bed and Breakfast which has 3 beautifully decorated guest suites. There is a sunroom, hot tub, sauna and swimming pool that overlooks the Okanagan Lake. The continental breakfasts were fabulous. Each suite is uniquely decorated. Ours was called the Ambrosia suite. Like all of the suites, it has a kitchen area as well as a private patio which opens up to a beautifully landscaped yard with lush green grass, flowering trees, rock gardens and Spring flowers popping up everywhere. We had another wonderful surprise waiting for us in our suite. Our best friends had arranged for a chilled bottle of champagne to be in our suite when we arrived. This is so very kind of them and so like them too. Thank you so much. By the way, our champagne was called Between Friends. It’s only available at this B&B. Holly and Colin, the hosts, have a small vineyard and make their own champagne. For a donation to help out a couple of boys and their family in Kenya, you may acquire a bottle or two to take home. We spent four wonderful days up here enjoying fabulous dinners, going on wine tours and tastings and we even biked a part of the Trans Canada Trail. This great walking and bike trail includes access to the Kettle Valley Rail trestles. So there it is…another adventure for us as we continue our life’s journey! If you are planning a road trip or a get away of your own, I highly recommend the Apple d’or and the Okanagan Valley. Thank you. We did have a wonderful time. We can highly recommend a trip to the Okanagan! I am new at blogging so I am happy that you found my blog. Thank you very much! I’m still new at blogging, and appreciate your kind words. that you enjoyed your stay at Apple d’or. Love your blog– very clever. Please come and see us again some time.